The initial surge of volunteers began to wane in 1915 and the government, shying clear of conscription, introduced the ‘Derby’ or group scheme in October 1915. Under this scheme, men went through the normal process of enlisting and if they were accepted, they had the choice of joining up immediately or going back to civvy street and waiting to be called up when needed. 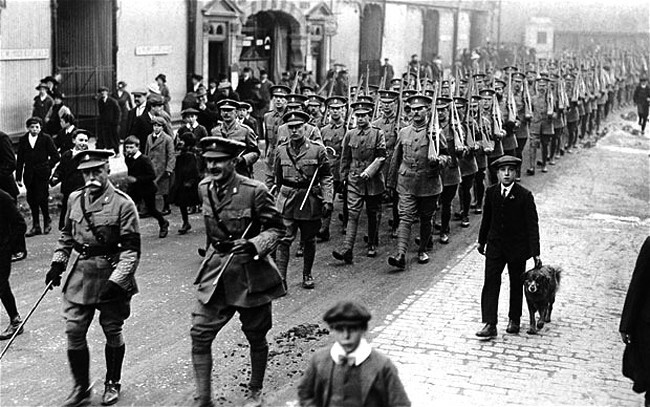 This scheme lasted until the introduction of conscription in May 1916. Those men who deferred their army service lived a normal life, wearing an arm band to denote that they were members of Section B Army Reserve and thereby avoiding the white feathers given out to those who appeared to have failed to do their patriotic duty. 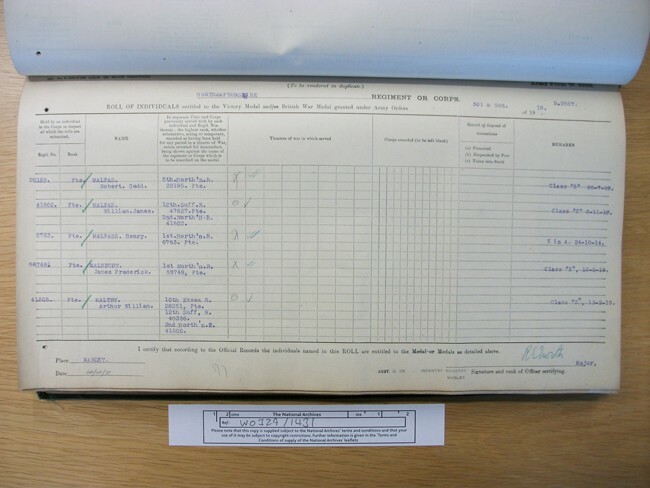 Chris Baker’s research shows that Arthur Maltby was placed into Group 41 of the scheme, members of which received their call up orders on 29th May 1916. They had to report to a regimental depot - in this case either Norwich or Bury St Edmunds. Once they had their uniforms, equipment and some initial instruction in the ways of the Army, Arthur and others were posted to the 3rd (Reserve) Battalion Essex Regiment at Felixstowe and began their basic infantry training. There are no precise dates, but it is likely that Arthur’s group went to France in September 1916, destined to fill the gaps caused by the losses of the Somme. Once in France, the new boys were sent to Infantry Base depots in places like Etaples, whose name has become synonymous with cruelty and deprivation during the arduous training. It appears that Arthur’s Group were in Number 15 Infantry Base Depot, Etaples, full of new arrivals and men returning to service after hospitalization and all awaiting transfer to a unit. There is evidence that Arthur and others were all lined up to go to the 10th Essex, when on 30th September, the order was countermanded and they all went to the 12th Suffolks instead. Thus Arthur appears never to have been in 10th Essex although it appears on his medal index card! The 12th Suffolks had been formed in July 1915 as a Bantam Battalion with troops below the minimum regulation height for army service, which was 5 feet 3 inches. They joined the 121st Brigade in 40th Division, which was made up mainly of Bantam battalions like the 12th Suffolks. The 40th division was not ready for active service until June 1916 and spent the period until October 1916 in the front line at Loos, a quiet sector, in which they could familiarize themselves with trench warfare in relative safety! At the point when Arthur and his group joined them, they were about to transfer to the Somme sector and possible involvement in the last phases of that costly campaign. The more I read about the First World war, the more I think that luck was the determining factor in whether you survived or not and part of that depended upon in which fighting unit you found yourself. The history of WW1 shows that certain units were much favoured by the high command and as such, were more frequently engaged in the major battles. Here I am thinking of the 8th,18th, 47th and 51st Divisions of the British army, together with the Australians and Canadians who bore the brunt of many of the post 1916 attacks. The 40th Division was obviously not one of the recognized strong Divisions and thus it was that Arthur and the 12th Suffolks had a relatively easy time of it throughout the latter part of 1916 and early 1917. Even in the Battle of the Ancre towards the end of the Somme, only the 120th brigade was used and the 12th Suffolks remained in reserve and were not used. Christmas 1916 was spent in a hut camp at Sailly le Sec, which was very wet, after which they moved further south into the Somme area and occupied the town of Peronne, after the Germans had withdrawn behind the Hindenburg line. The History of the Suffolk Regiment by Lt Colonel C C R Murphy provides details of the 12th Battalion’s activities during the spring of 1917. Unlike other battalions of the Suffolk regiment, the 12th Battalion took no part in the Battle of Arras, remaining in the Somme area around Gouzeaucourt and being involved in a number of trench raids. These raids were frequent between major battles, being designed to stir up the enemy and make him realize that not all was quiet. Also intelligence was gained about enemy activities through the capture and interrogation of prisoners. The battalion War Diary describes one such raid on 22nd May 1917. 2/Lt H Leeming met a patrol before reaching the enemy trench & after a short engagement captured a wounded prisoner belonging to the 124th ERSATZ REGT. It was an extremely dark night & nothing could be seen if more than about a foot away. It is believed that several casualties were inflicted on the enemy. Our casualties 1 OR died of wounds 4 OR wounded. All parties back in our trenches by 1:30 am. The weather was perfect and the sector quiet ,the village providing fruit and vegetables for those who sought. Amid surroundings where the rigour of war could sometimes be forgotten it was perhaps only fitting that the battalion should receive a rude reminder of the enemy’s presence when one day in the early morning mist a section of the front line was gas shelled causing a score of casualties mostly fatal before the presence of gas was detected. Once again, the hidden enemy had made their presence known even in a quiet rural setting. Waiting for something to happen was punctuated by more trench raids, some of which were on a large scale. On 25th September, over 200 men were involved in an attack at Gonnelieu, resulting in the bombing of German dugouts and the capture of 5 prisoners at a cost of 100 casualties. One has to ask if it was worthwhile? On the night of 25th September we raided the enemy trenches after a heavy artillery bombardment. The enemy saw our party forming up in no man’s land and his barrage came down minutes before ours causing considerable casualties. Our raiding party advanced and was followed across by the enemy’s barrage They reached their objectives & besides killing many in the trenches bombed several dug outs. Our casualties were 1 officer wounded 4 officers missing and 95 OR s.
Please convey to 12th Suffolks the congratulations of the Corps Commander on their success & on the fine spirit shown by all ranks during the raid. After a period of training in mid November 1917, the 40th Division moved to Beaumetz on the road to Cambrai and on 22nd November were south of Bourlon Wood. 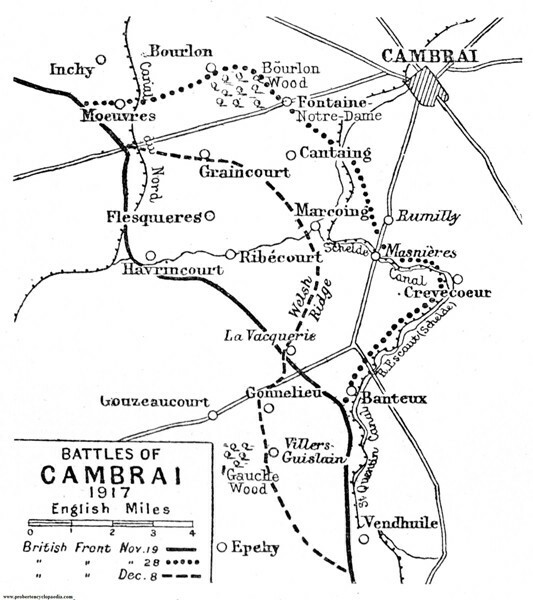 The attack on Cambrai and the Hindenburg line was designed as a surprise. For the first time, it involved massed ranks of tanks and proved initially successful except for Bourlon wood which held firm. The wood, as was usual in this war, dominated a high position, from which the Germans could pour down intense fire upon the attacking troops. Yet again, a battle had begun well but got bogged down by one heavily defended area. On 22nd November, the 40th Division were ordered to take over from 62nd but the roads were so badly damaged that it took them 15 hours to travel 9 miles. The 121st Brigade was given the task of capturing Bourlon village. So, on 23rd, they attacked in the mist over 1000 yards of heavily shelled land and heavy machine gun fire. Not surprisingly they did not reach the village and the survivors withdrew. The fighting continued pointlessly for days with no positive results. 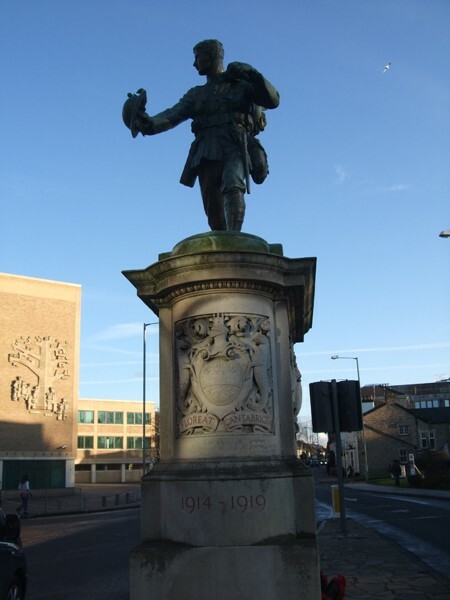 The 40th Division had experienced its first major battle at a cost of 172 officers and 4017 other ranks and the 12th Suffolks alone suffered 150 casualties. BOURLON 24 10AM Received orders to attack BOURLON VILLAGE. Issued orders for attack. 3PM Attack launched B coy penetrated village on the right . D coy held up by MG fire A coy moved to reinforce D coy C coy reinforced B coy. 5 PM News received that Battalion on right was digging in in the wood & issued orders for Coys to retire to old line. After all coys had withdrawn positions were taken up 2 Coys of 12th Suffolks on left front. In early December they went into the front line of the old Battle of Arras around Bullecourt, where in May and June 1917, the Australians had lost so many men. They spent another Christmas Day 1917 in a hut camp before returning to Bullecourt. On the night of 5th January 1918 they were subjected to an enemy attack which overran an advanced post and took a sap out of the battalion front line, before a counter attack captured 30 Germans and restored the trench to British control. Preliminary report on enemy attack on 12th Suffolks on morning of January 5th. At 6 10 am the enemy opened a heavy barrage lasting about 20 minutes on the front and support lines of the Battalion sector. The attack was partially repulsed the enemy having succeeded in entering our lines including a sap. At 9 30 am attempt was successful in driving the enemy out of trenches into the sap and finally out of the sap. The enemy then counter attacked 3 times from the SUNKEN ROAD. A final and successful counter attack was made at 5 15 pm and our whole line completely restored. This trench life of attrition and wearing down each others’ capacity to withstand attacks, went on endlessly. Backwards to billets behind the front lines and forwards to the trenches again. It is no wonder that some men’s nerves cracked under the constant strain of it all. Some 80000 cases of shell shock, as it was called, were recorded by the British army in WW1. Arthur Maltby and the 12th Battalion Suffolks were in a training camp when the expected German offensive began on 21 March 1918. The plan was to attack the British across the old Somme and Arras battlefields and to punch a hole in their defenses before rolling up the rest. The Germans guessed that the British had been weakened by the campaigns of 1917, culminating in the Passchendaele carnal house. This was not far from the truth - as a shortage of reinforcements had forced Haig to cut the brigade strength from 4 to 3 battalions and to stretch his limited resources across a wider Western Front. Lloyd George, fearful of even higher casualty figures, refused to provide Haig with the new men he had asked for, even though they were sitting in training camps back home. So it was, that the British awaited an attack from a newly strengthened enemy who had been able to move divisions from the eastern front after the capitulation of the Russians. The Germans attacked under cover of fog after the biggest artillery barrage yet seen. This barrage had been targeted behind the British front lines to prevent artillery support and reserves being moved up. The specially trained Storm troopers did their job of bypassing the advanced defence posts and getting behind them. Everything happened so fast, that in many sectors the British did not know what had hit them. For the first few days things looked extremely dangerous. The 40th division was ordered to move towards St Leger between Arras and Bapaume, where it dug in. But by 22nd March, it found itself practically surrounded by waves of attacking Germans. It was at this point that the Battalion lost its commanding officer Lt Col Eardly-Wilmot, who was shot by a sniper through the mist. The message to withdraw did not reach the Battalion. As a consequence, the men of three companies were almost all killed or taken prisoner. By some miracle, the survivors of the 12th Battalion were able to withdraw right through the enemy under cover of darkness and on 26th they were withdrawn from the fray, having suffered 367 casualties in March. 22ND 6am The Commanding Officer Lt Col T Eardley- Wilmot D S O took a platoon out of the front line to form a forward platoon & cover the gap on our left. There was a very heavy ground mist and the enemy snipers had taken up good positions and sniped the CO and the artillery liaison officer killing them both. Our forward coys were ordered to fall back to the Army line The message was delivered but too late as no one from the 3 coys returned. Remainder of Battalion retired to MORY COPSE. 11pm to 1 am the enemy attacked but we held the line on our front. Night 23rd – 24th comparatively quiet but enemy shelled our positions and sprayed us with MGs all day. March 25th 3pm enemy attacked in force on wide front but did not reach our trench. At 8pm this line was evacuated and the remnants of the Bn. marched to AYETTE where they spent the remainder of the night. Exhausted, depleted and traumatised by their experiences, the survivors of the 40th Division were moved north to a front around Armentieres, which had been a quiet sector. British intelligence had not discovered the fact that the German attack was made up of several components. Thus, on April 9th at 4.15 am, the enemy attacked in the very place to which the 40th Division had been sent, the River Lys. The 12th Suffolks were called from reserve to defend around Fleurbaix, where it put up a great defence, inflicting substantial casualties upon the waves of attacking Germans, until at 4.30 pm it fought a rearguard withdrawal. 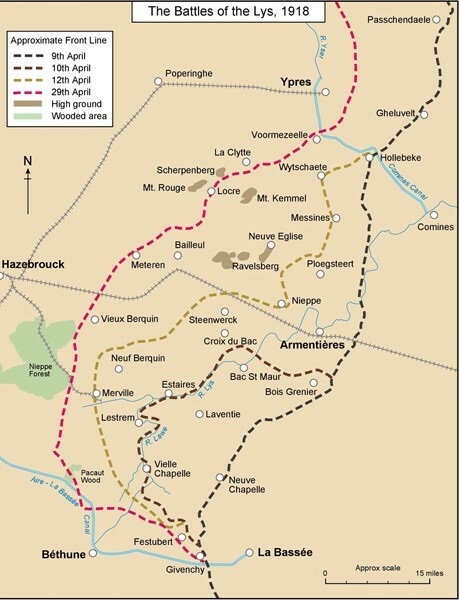 On 10th April it withdrew across the River Lys to Nieppe, where it dug in before withdrawing further west to be in front of the major railway terminal of Hazebrouk. 4 15 am A very heavy bombardment by enemy was put down on front line and FLEURBAIX defences a tremendous amount of gas being used. The fighting was severe and continuous and very heavy losses inflicted on the enemy who continued to move in sections in single file across our front towards the WEST. 2pm Battalion ordered to counter attack and restore position. At 6pm orders were received not to press the attack but to hold on to our positions until 8 30 pm. Our casualties were heavy about 70 in this attack but we inflicted heavy casualties on the enemy. In this fighting very gallant service was rendered by the 12th Battalion Suffolk Regiment 40th Division who held out in Fleurbaix until the evening though heavily attacked on three sides. So ended the 12th Suffolk Battalion’s involvement in the German offensives, having lost 423 men from their ranks. Like other Divisions and Battalions, the 40th was understrength as the result of their defensive tasks of March and April 1918. The 12th Battalion was reduced to cadre in May, with 21 officers and 630 ORs being sent to base depot for redrafting. This was how Arthur found himself posted to the 2nd Battalion Northamptonshire Regiment. According to Chris Baker’s researches, it was on 17th June 1918 that Arthur and the other Suffolk men were at “D “ Infantry Base depot at Rouen, when they were transferred to 2nd Northants, Arthur becoming Pte 41505..
Limeux 19.6.18 The Battalion was engaged on musketery and range practice. The Battalion received 288 ORs. Thus, Arthur Maltby and the others from the 12th Suffolks were part of these drafts to restore the 2nd Northants to fighting strength. The war was moving into another phase, which became the Advance to Victory. The Germans had thrown everything at the British from March to June 1918, but although forcing them back to the outskirts of Amiens, they had failed to break British resolve. To the contrary, it galvanized the BEF high command into planning and executing its greatest success of the war, the Battle of Amiens in August 1918, which heralded the beginning of open warfare. On 9th July, the 8th Division moved to the north of Arras and into the front line, Oppy Willerval sector, where it was engaged in a number of local attacks in preparation for the big break-out to capture the plain of Douai. August 21 On the night of August 21st a strong force of the enemy attempted a raid on the Battn front. The promptitude with which its garrison handled their weapons prevented the enemy from penetrating our lines. The raid obviously on a large scale was quite unsuccessful the enemy beat a hasty retreat. Sept 20th Raid carried out by an officer and 12 men ( A coy ) on enemy post N of OPPY WOOD. The party undertook the raid after a heavy artillery bombardment and the party achieved its objectives. The party returned without a casualty. 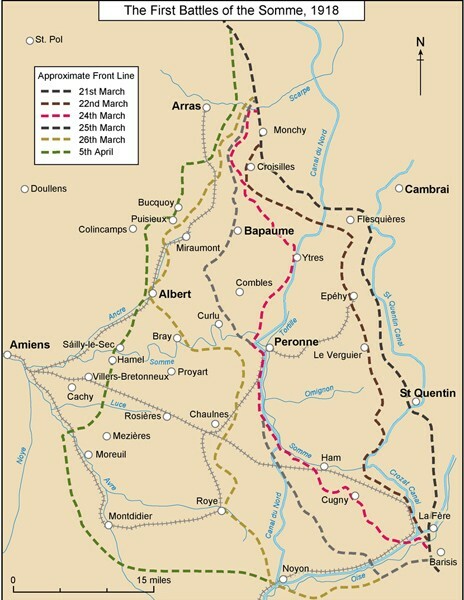 It was not until October 1918 that the 8th Division became seriously engaged in the advance - pushing the Germans back across Northern France to Douai , Valenciennes and Conde. Again, it appears that Arthur Maltby and his comrades in the 8th Division were lucky not to be involved in some of the fiercest fighting of the last 100 days, where daily casualty rates were some of the highest of the whole war. 10.11.18 Battalion marched from La CROISETTE to BERMISSART via ODEMEZ and MACOU. 11.11.18 Battalion remained in billets in BERMISSART. Armistice with Germany commenced at 11 00 when all fighting ceased. 12.11.18 Received news that 8th Division was to be one of those forming the Army of Occupation of Germany. This very brief description of the ending of a war that had killed almost 1 million British and Empire troops captured the mood of the fighting men. Allied troops moved into towns and villages previously occupied by the enemy who had slipped away before the 11th hour. Many were elated at the ending of hostilities, but many felt an anticlimax at the end of their soldiers’ way of life, and the prospect of returning to civvy street and the unknown. However, as we can see from the above entry, the 2nd Northamptons still had a role to play in the Army of Occupation. 15.11.18 Orders received that the Division would move to the vicinity of TOURNAI. SILLY Dec 25th Christmas Day Divine Service in the morning. The Division remained in Silly during January 1919, taking part in various sporting events and educational lectures, as well as parades and equipment cleaning. Then, on 22nd January, the 2nd Northamptons began a march to Brussels to take part in a ceremonial march past in front of the King of the Belgians. Jan 25th Battalion marched to Brussels a distance of 15 kilos .The battalion was billeted in the suburbs of Brussels known as St Giles. Excellent billets were obtained for all ranks. BRUSSELS Jan 26th Representatives of all arms of the 3rd Corps marched past the King of the Belgians and through the streets and boulevards of Brussels. During the march past the regiment was preceded by Private Taylor leading “ Wolf “ the Regimental Mascot a German messenger dog captured by the Regt in August 1917 at Stenwoord. The Regiment marched past in eights with bayonets fixed. On reaching the King of the Belgians who was accompanied by the Prince of Wales and Prince Albert at the Palace the Regimental Band wheeled to the left countermarched and halted playing the regiment past to the Regimental march. The turnout and marching of the regiment was highly creditable and from information received from all sources including the Belgian Press showed that the regiment upholds its magnificent record as one of the finest in the British Army. Jan 27th The whole regiment was given leave from after the parade 26.1.19 to 0730 Tuesday 28.1.19. Everyone enjoyed themselves to the full in Brussels. It was noticed how very kind all the people of Brussels especially those on whom the Regiment was billeted were to our men. Jan 28th The Battn started to march back to billets at Silly. Those of us who love to see the ceremonial duties of the British modern day army on state occasions, can only wonder at the magnificent sight afforded to the people of Brussels by this march past, which must have brought home to them the end of the German occupation. Arthur Maltby and the other men of 2nd Northamptons, no matter how cynical they might have become about army life, and no doubt longing to return home to wives and family, must have been proud to be representatives of the BEF marching through the liberated capital of the country, the protection of whose liberty had prompted the declaration of war in 1914. For me, it brings feelings of emotion to know that one Maltby relative marched through Brussels at the end of WW1, whilst 26 years later, my own father with the Royal Engineers of the 3rd Division of Monty’s Army, marched through Brussels at the end of WW2. He too, like Arthur, was well treated by the population and much enjoyed himself in the city. 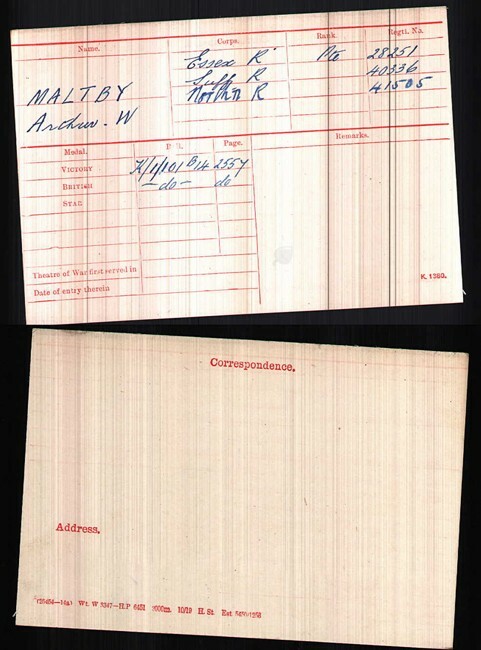 According to the Northamptonshire Regiment’s Medal Roll, Arthur Maltby was transferred to Class Z Army Reserve on 13th February 1919. This meant that he left France for England, going to a hutted camp acting as a Dispersal Centre. This was the standard route out of military service. Arthur was then able to return to civilian life in Cambridge, though until May 1920 he could have been called up in the event of a national emergency. Many had thought that the armistice would not hold and that hostilities might break out again. This proved to be unfounded as Germany was in a state of internal turmoil and the population was totally exhausted and fed up with the war.